Have I learned yet to love uncertainty? Creating work in ceramic is not like painting. When you put a combination of glaze chemicals on clay and subject them to high heat, what you get is almost always surprising, even though you may have run many glaze tests and fired pieces under identical conditions. You do your best to control your outcomes, but it’s always a surprise. 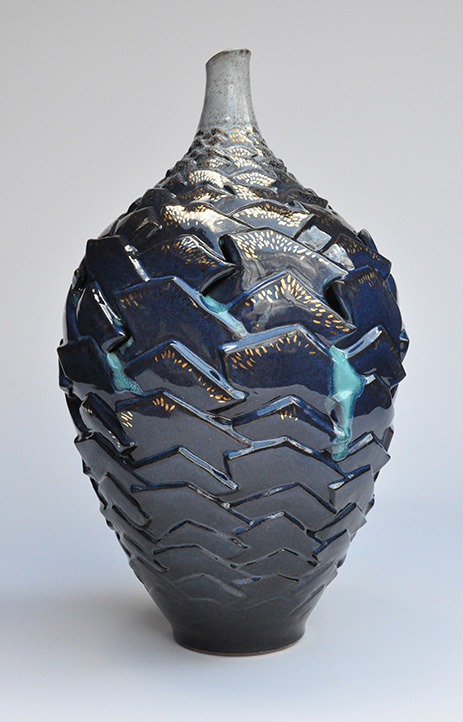 I recently made a piece, the second iteration of an earlier ceramic vessel. Both vessels have the same title, “Centrifugal/Centripetal: The Dark Night of the Soul (#1 and #2”). Both have similar form and pattern, and for both I used the same combination of glazes, fired them the same way, with the same firing protocol, to the same temperature, and in similar kilns. 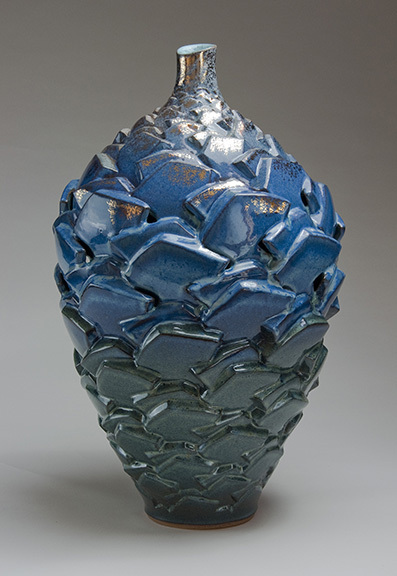 In the earlier vessel I used two different glazes on the outside, tapering one off as it reached the middle of the vessel, and starting the other at the midpoint where it overlays the the first glaze. If you look at the finished piece, it doesn’t have much variation in color, though at the top and bottom, where the glazes aren’t layered, there is differentiation. I did a third firing with gold luster, which gives it its gold highlights at the top. One unexpected and wonderful surprise when I unloaded this piece from the kiln was the strong gush of the turquoise glaze from the inside that melted out in the firing. While I didn’t plan that, it added to the piece conceptually. Centrifugal force is the force moving away from the center; centripetal is the force moving towards the center. The movement of the patterning in this piece is around and up. At its widest, the parts start to separate (centrifugal) but then come back together as the form collapses toward the center (centripetal). “The Dark Night of the Soul” refers to a mystical poem by St. John of the Cross in which he describes the difficult journey of the maturing soul to union with the Divine. The Dark Night is when the soul feels most distant from that union, and yet in fact is closest; hence, “Centrifugal/Centripetal”. The flow of the turquoise from the center is like a premonition of the inner effulgence that will be reached when the movement reaches the top and goes to the inside, to the inner dimension. The second piece of this title looks quite different from the first. With this one I made an effort to use the thickness of the glazes to get more variation in my result. With glazes, thickness can significantly change the color and effect. While I tapered the outside glazes as I did with the first piece, I also brushed added glaze to some surfaces before spraying to add to the glaze’s thickness and its resulting color and look. Still, I couldn’t have predicted the results exactly. Look carefully at the image, starting at the bottom. The #1 glaze that I used at the bottom turns slightly greenish when it reaches hotter temperatures, but when it meets the #2 glaze, sprayed first, the blues start to pump up, while still remaining somewhat dark. As you continue up the vessel, the blues start to vary, partly because of the varying thickness but also because I’ve tapered the #1 glaze off and the #2 glaze starts to take over. There’s quite a lot of subtlety to the color change as your eye moves up the vessel. Since I liked the gush of turquoise on the first piece, I purposely and heavily brushed the turquoise glaze in the openings at the widest point in the second vessel. I packed it in, hoping that I would get some of the same gushing effect that I’d gotten in the first vessel. As you can see, it didn’t happen. In the second piece I also applied the gold luster with a different implement, so the gold doesn’t look the same as the first piece, either. If someone asked me which of these pieces I liked the best, I’m not sure what I would say. I remember being a bit disappointed that there wasn’t more color variation in the first, but I loved the gush of turquoise. Even if I’d had more of the turquoise in the second piece I don’t think it would have shown as much on that background of rich color variation. I do love the color, though. But do I love the uncertainty? Hmmm. I don’t know. Control is a hard thing to give up. See more of Judith’s work at her website.